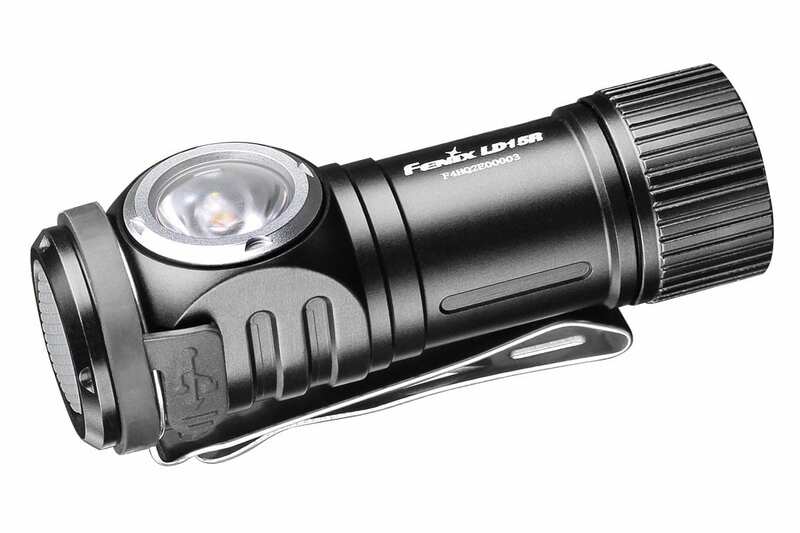 The Fenix LD15R rechargeable flashlight is a compact, hands-free light source that utilizes a right-angle head—perfect for those that need forward facing 90 degree wide angle light for high and low light situations. This light is compatible with MOLLE / Body Cam systems for the professional environment or can be a perfect fit to clip on your backpack for those personal hikes. The two-way body clip and magnetic base allow you to mount this light to just about anything. Powered by a rechargeable 16340 battery (included), this tiny flashlight blasts 500 lumens at a distance of 279 feet (85m). Easily switch between the seven lighting modes that include white and red light options. IP68 rated waterproof and dust proof build will ensure this light is there for you when you need it. *The runtime of Turbo is the accumulated time when time-limited downshifting activates and works. With the light switched off, press and hold the top switch for 0.5 seconds to turn on the light on the last used output. With the light turned on, press and hold the top switch for 0.5 seconds to turn off the light. With the light switched on white light mode, single click the top switch to cycle through Low→Med→High→Turbo. With the light switched on red light mode, single click the top switch to cycle through Red→Signal Light→SOS. In white light mode, press and hold the top switch for 1.2 seconds to enter red light mode. In red light mode, press and hold the top switch for 1.2 seconds to enter white light mode. With the light switched off, single click the top switch. The battery level indicator will display the battery status for 3 seconds. Note: There is no indication when CR123A battery is used. Turn off the light. Plug the USB side of the charging cable into any USB power supply. Uncover the anti-dust cap of the light, and plug the Micro USB side of the charging cable into the charging port of the light. The battery level indicator displays red while charging and turns to solid green when charging is complete. The normal charging time of the included Fenix ARB-L17-700 is about 1.5 hours. Once charging is completed, be sure to remove the charging cable and replace the anti-dust cap to protect against dust and foreign objects. Recharge a stored light every four months to maintain optimum performance of the battery. Only Low output can be used when the light is being charged, but charging time will be prolonged. The light will accumulate a lot of heat when working at Turbo output level. To prevent high surface temperature the light is programmed to downshift to 200 Lumens after working for 5 minutes. The light memorizes the last selected brightness level on white light mode. When turned on again the previously used brightness level will be recalled. When the voltage level drops below a preset level, the flashlight is programmed to step down to a lower brightness level until Low output is reached. When this happens in Low output level, the battery level indicator will display red and the flashlight blinks every three seconds to remind you to replace the battery. To ensure normal use, the flashlight will work until the battery runs out. Note: This only work with the rechargeable 16340 Li-ion battery. This flashlight is a high-intensity lighting device capable of causing eye damage. Avoid shining the flashlight directly into anyone’s eyes. compact light with plenty of features. Very handy light. I use it all the time in my field of work. Magnet has a firm hold. I also charge it during my drive time between calls. Awesome. I use this on patrol at night. Great for interviews. Three times brighter than my issued patrol light. Beam wide enough it Illuminates my notepad while I write and keeps light in suspect’s face. Clip is sturdy enough to clip by my shirt buttons without falling off. I love when it’s clipped there on my shirt because the light is not blocked by a jacket. Most cops where lights on the lapel which requires to move to jacket lapel. Love the light and highly recommend!!!! I use this for law enforcement related duties, It fits nicely above my Body Worn Camera, helps me write tickets and do other tasks handsfree, a very handy light indeed and great purchase! I highly recommend ordering one to add to your collection or to keep as a backup in emergency situations. I love the magnetic base as well! great overall design. Purchased to attach to life vests. Needed to attach lanyard from vest to light. Overall an excellent product except there is no molded hole in body to attach a lanyard or clip. The holes on the spring clip are terrible to attach anything to and in wrong place. In my opinion a molded lanyard hole as in other lights on the bottom centered at back of light would be useful. Light is great, just battery life is kind of short. I will have warranty contact you about that battery Michael. Perfect everyday carry. Tiny & bright. Smaller than a Bic lighter. Great bike light too. Headlight or rear red tail light. Almost perfect! I leave it clipped to the visor in my truck as an addition to my dome lights. Red secondary LED is a perk, and USB charging makes it right at home in my truck. My only gripe is that it doesn’t have memory when in “red” mode. Awesome light, perfect size at an affordable price. I just love this little light I EDC it. It fits in the change pocket on my jeans. I use it ever day at work and at home the low setting is perfect for getting around the house at night instead of turning on the lights. The only thing I would change is to have a magnetic charger not sure if I trust the little rubber plug on the charging port when around water. I highly recommend this little light to my friends awesome product. Great hands-free torch. Clip in on and do what you’ve got to do. Good selection of brightness settings, means to check the state of charge, excellent battery life per charge. Great little light. Nice touch with the magnetic feature. great light. Very bright and the magnet is very helpful. Excellent light at an amazing price !! Sorry to hear that Justin. I’ll have Colt in Warranty reach out to help you. Placed on uniform pocket. Nice features and run time. This flashlight exceeded my expectations. This turned out to be the best item for the purpose I use it for, all around best lights made period ! Great product, will be buying more from Fenix. Keep up the great work guys. Love it, and use it more than expected. Always have it on me as an everyday carrier item. As a park ranger I use it to write late night tickets in the park. Didn’t know if I would like the right angle design but after using the light , it works. I wear it clipped to my shirt pocket. 2. I would like some easier way to remove/replace the pocket clip. Especially with its larger profile, it gets caught on things and bent way out of shape sometimes and it was a challenge getting it back into working shape. It almost made my entire light no longer fit for my purpose of every day carry. Still, I am in love with this light! I was looking for a right angle light and this one was everything I could have looked for and more! Keep up the great work. Big performance in a small package. Fenix delivers once again ! Unfortunately I was let down by this little light. If the light had less flood and a stronger magnet I think it would be an awesome little EDC. I find it virtually useless unless it’s on the highest output mode because of the lack of focus the beam has. I have been a big fan of Fenix lights for years now, I have several of their products and none have been a disappointment. I have used this light in EMS work regularly over the last year and have noticed several pros and a couple of cons about it. Size: this light fits perfectly on most duty-belt sized belts or webbing as well as MOLLE platforms, I have used it on both and found that it seems to prefer more rigid platforms when not being held in the hand. The top button is not easily accidentally pressed by clothing or movement when carried on a belt. If not attached to something the light is relatively unobtrusive when carried in a pocket or pouch and I have actually forgotten it in my pockets when putting my pants in the wash. Waterproofing is 100%. Function: Light modes are very well thought out, high will cast enough light on a small room to walk comfortably, low can be used for pupil reflex assessment without pain, and turbo is light a small spotlight in your hand. The quick check battery level indicator is very useful especially for those of us who don’t use the light every day. The red light modes are useful for both retaining night vision and signaling. Construction: As mentioned above, waterproofing is 100%. Dropping this light from a normal use height hardly seems to phase it, the anodized surface might get a little scratched but the function remains unchanged even after falling down a flight of stairs. I do have a slight problem with the belt clip which will be discussed below. The magnetic base is surprisingly strong and very useful for engine work or tire work on the side of the highway in the dark of night (experience speaking there). Power source: I highly appreciate the recharge feature of this light. Since the battery is relatively small in capacity it charges fairly fast both from a wall outlet and from a car charging port, and the choice of plug is an easily obtainable phone charger should a new one be needed. Belt clip: Honestly this is my biggest complaint and in terms of the overall light its not a terribly big deal. The choice of metal/choice of tempering of the metal is a little less springy than I would like on a light designed to clip on a belt or strap. My clip bent out just enough to loose it’s tension on both ends within the first 2 months of use. My other complaint with this clip is its non-replaceable and since belt clips on the majority of objects with them are notorious for breaking I feel like it could have been made closer to the design of a c clip. Price: I am a firm believer that Fenix makes high quality products and I do not have any issue paying a little bit more for the quality they provided. That being said, I do feel that $50 is a little high for a light of this size. Overall: I feel like the light is worth it even if the price is a bit high. Fenix has a stellar reputation and this light delivers in full. This is a great little light. I use it often in woodworking or electronic work. Inside a cabinet the right angle puts the light where I want it. It is also easy to carry around. I always have it in my tool belt. I can’t stop playing with this light! Ive been a customer of Fenix Lighting since 2011, with my first ever true flashlight being the original TK 15. It’s amazing how far flashlights have come. This light is going to be perfect for night walks in the woods. The people at Fenix truly do put thought into their product and this is shown by the addition of a red light. I will continue to buyFenix over all the others. Truly an excellent flashlight for every day carry. It is small but provides superior lighting (in four white light modes and three red (night vision) modes – turbo mode is the brightest of the white light modes with a 500 lumen output). It can be readily clipped to your clothing or pack to facilitate hands free viewing. I often have to work in darkened areas and being able to view maps and schematics without holding a light or having to bring a utility light with me is very convenient. The base is magnetized so you can attach to light to a steel surface if one is available – it makes illumination more convenient. The flashlight casing is ruggedized and survives impact (from a 1 m drop) and water immersion (shallow water for 30 minutes) which is great. Convenient battely life indicator on the switch allows you to keep tabs on the amount of charge available. Rechargeable batteries are also a plus. This is a well engineered flashlilght. Great flashlight for its size and meets my needs during hikes especially well. Works great as an attachment to shoulder straps of backpacks, but I recommend adding an extra lanyard to avoid losing it if the clip fails to hold the flashlight in place. As a returning Fenix customer I’m not disappointed. This is a very manageable size for every day carry, I LOVE the magnet and the red light mode for reading! I’ve used Fenix flashlights on everything from hunting to camping to fixing things around the house. In my opinion, they are second to none. This is definitely an example of the phrase, you get what you pay for. In this case it’s quality and reliability. Nice design and especially like the magnetic cap and red light. Great light. Very bright. Replaced my Streamlight clipmate. I wish it was possible to rotate the clip around the body of the flashlight so you could change the angle of the light. This is THE single best utility light that I have. Always has what you need with the four brightness settings and the red to save night vision. Magnet and clip top it off and make it the light that I carry everywhere. Dual-fuel is a great feature. Great little light, works very well considering the size. The only thing keeping it from being 5-stars is the two way body clip. I wish a slightly thicker metal clip was used to provide greater retention. This light is FREAKIN’ awesome! Smaller and lighter than I expected (good thing). Clips on nicely sideways on my SAR pack shoulder strap, small enough that it doesn’t get knocked around. Excellent lighting options, the second stage is bright enough for most close quarter (indoor) applications. Love that the recharger is built in. Thanks Fenix! This light has come in handy, we were working on my car and used it constantly. The magnet feature really comes in handy. The only gripe i have is that the magnet doesn’t seem strong enough as it would easily fall off when brushed against slightly. But to Fenix credit, it still works and is built solid so no worry if you drop it from a meter high (which I did). Great product and i’m super happy with it. Very compact to keep in your car and not have it take up space. Things I like about it: – construction very solid, but lightweight, – the 4 brightness settings – the brightest is REALLY bright, – 90* headlight – will clip on to my backpack very easily and magnet is a nice feature. Build quality is very high. All machined parts, with great, tight fits. Light is extremely bright and the multi-functional modes are a great feature. This flashlight beats my old one in every conceivable way. Great for light backpack trips. I’m very happy with this light! I’ve found the magnetic base makes this light a very useful tool for household chores and odd jobs. I build my own computers and sticking this light inside the case makes it much easier to work inside it, rather than holding a small flashlight in my mouth or wearing a stupid head lamp. While I have not had the flashlight very long, the right angle beam is a great idea. The white beam is bright and the red beam is great for night operation. I have it clipped to the front of my tactical vest. I enjoy the recharging feature that let’s me use a universal USB cord, instead of trying to keep track of a unique charger. So far each Fenix product I have purchased is as advertised and is great quality. Great little flashlight… surprised me how good it is! Pint size, bright, has red light also, dual purpose pocket clip, USB rechargeable, but also battery replaceable. Love the right angle feature, and the red LED. Just clip it to your pocket and go night hiking. Light weight but packed with features. The magnet has already come in useful on several occasions. Compact and bright. I like the side lens and the magnetic base. Just a fantastic little light! I bought one for a hunting buddy of mine. He loves it! I love my new LD15R. Check out the video I found on Youtube. I have no clue how someone gives this product 2 stars for simply not having strobe when it seems clear on the page….knock it down a star maybe, but 3 stars decline for that…geeze. My evaluation. This product is extremely versatile. Super compact, nice bright spill beam, and tons of options in light. I think the video on this page really shows the versatility of the product, but I would like to add that the product is extremely lightweight. I mean forget your wearing it lightweight. Another point with this light is that you can take the rechargeable battery that comes with it out and replace with a backup battery (another rechargeable or CR123A). Great feature for campers, hikers, and commercial use where you can’t have the battery go down for any of the time your using it. First I have to say WOOOOOOOOOOOOW!!!! such a small compact light with the brightness of a monster. I love this light!! I want to own 10 more. love all the features and will definitely be recommending this light. Fenix loyal!! Received these today 20180324 . I am not going to keep these. I am happy that Fenix has gotten rid of the magnetic charging port in favor of a standard micro USB port, but the light does not have a strobe feature which was the main reason I purchased it. This light puts out a decent amount of both red and white light (not combined) but only red has a program that will allow it to —___— SOS . I always purchase Fenix lights from fenixlighting.com and must have read the description wrong. I believe I interpreted “turbo” to mean fast strobing. 3 out of 16 people found this helpful. Was this review helpful to you?